UBC recognized its own recently with the 2014 Staff Awards of Excellence. Pictured are, from left: Lisa Castle, UBC vice president of human resources; Pauline Brandes, UBC Okanagan campus director of human resources; Robin Whittall, Staff Award of Excellence for Sustainability; Malcom Petch, Staff Aware of Excellence for Enhancing the UBC Experience; Tracey Hawthorn, Deputy Vice-Chancellor and Principal’s Award of Excellence; and Deputy Vice-Chancellor and Principal Deborah Buszard. Absent is Sandra Mecklenburg, Staff Award of Excellence for Leadership. They toil in the background of the university campus. Working diligently behind the scenes, they make sure labs function, faculty programs run efficiently, information technology systems operate seamlessly and that UBC’s Okanagan campus delivers a top-tier education to its thousands of students. They are the support staff members of the university community, and with the 2014 staff awards of excellence, UBC has honoured four of its own for their determined efforts. 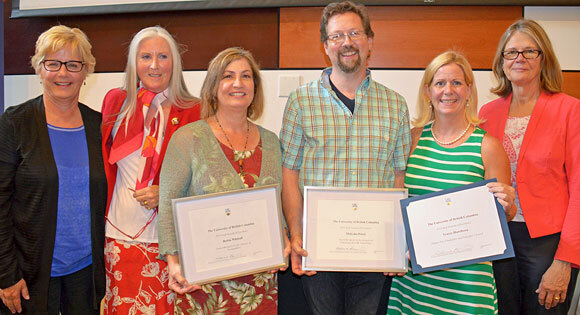 Tracey Hawthorn, Robin Whittall, Malcolm Petch and Sandra Mecklenburg were recently recognized for contributions that enrich the UBC experience for students, faculty and their co-workers. Hawthorn was presented with the Deputy Vice-Chancellor and Principal’s Award of Excellence. Hawthorn, a member of the human resources department, was recruited in 2010 to re-imagine the approach to sick leave and return to work. The result is the Work Reintegration and Accommodation Program (WRAP). Hawthorn’s knowledge of physiotherapy and kinesiology and imaginative approach reduced the campus’ average number of sick days from 7.3 in 2009 to 2.5 days in 2013. Hawthorn also increased health and wellness activities on campus, and her work with a local employers’ community of practice on mental health in the workplace has been recognized by the Mental Health Commission of Canada. Mecklenburg, lab manager in the Irving K. Barber School of Arts and Sciences chemistry department, was recognized with a staff excellence award in leadership for her efforts to decrease the amount of lab waste produced. She was also lauded for her mentorship and guidance of teaching assistants. Petch, audio and visual support analyst with the Information Technologies, Media and Classroom Services department, received the staff award of excellence for enhancing customer service experiences at the University. Petch routinely solves vexing IT issues and counsels staff in use of technology for such activities as teleconferencing and collaboration between the UBC campuses to enable virtual meetings and reduce staff travel time and costs. Whittall, career advisor with the Advising and Involvement Centre, was recognized with the staff excellence award in sustainability. She has led development and continuation of several successful campus programs including the Senior Student Lifeline, a program to assist graduate students to successfully transition to post-graduate life. She has also been instrumental for the past seven years in establishing the Women in Science and Engineering program.